Bio Collectors services are tailored to suit each of our customer's specific requirements. No matter if you're a restaurant producing a couple of bins a week or a large manufacturing site that produces tonnes of food waste, we have a service that will fit your business needs and your budget. We can even collect CAT3 and ABP/Butchery waste at no extra cost. 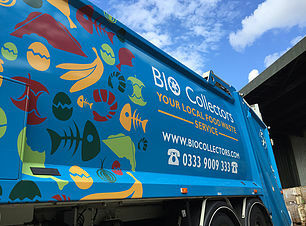 If your business is within the M25 and produces food waste, Bio Collectors can help reduce your waste costs. Our tipping service will provide your site with 120 or 240 litre containers for all your food waste needs. The containers are then simply emptied and returned to site after each scheduled collection providing a convenient and simple solution to managing food waste disposal. 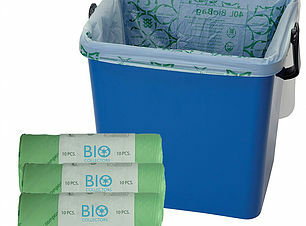 Bio Collectors can also supply your business with internal caddies and durable biodegradable bags if required, to help your staff segregate food waste more effectively and maintain higher standards of hygiene in any production area. Bio Collectors will provide you with our own specialist 120 litre containers for your food waste. These are picked up and exchanged for freshly cleaned and sterilised containers after every service. This helps to ensure that your food waste disposal area is kept hygienic and odours are reduced with the minimum of effort. An exchange service is the best food waste option for any site that needs to maintain a high level of hygiene without the associated difficulties of cleaning and maintaining food waste containers. For manufacturing or large scale production sites the expense and disposal of food waste is a major consideration. Bio Collectors offer a cost-effective bulk food waste collection service, allowing large quantities of liquid or solid food waste to be managed with ease. 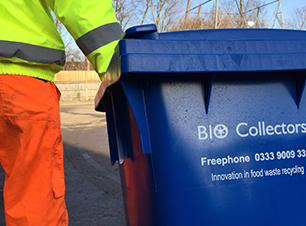 Bio Collectors can service your site to an agreed schedule or you can simply request collections as needed allowing you to control costs whilst providing ample capacity for your food waste requirements. Every collection we perform is recorded using our live booking system. You can receive e-waste transfer notes to any number of specified email addresses as soon as we complete your service meaning less time worrying about your collections and more time running your business. For sites without the space or waste volume for bins or other containers, Bio Collectors offer a specialised bag only collection for your food waste. Initially available to selected London postcodes only, Bio Collectors' bag-only service is designed to provide flexibility and control of your food waste costs with the minimum of difficulty. Each specially designed bag costs only £1, with all collection and recycling charges built in. Additional bags can be easily ordered through the web store 24 hours a day. Click below to check available service areas or to sign up. As a preferred supply partner for a number of years, Bio Collectors continue to deliver ERESE outstanding service and support. With a friendly team matched with reliable collections, they are both accessible and responsive and a valued member of our supplier network. Sheldon Payne, MD - ERESE Ltd.
Bio Collector's bulk collection service is very important to the smooth operation of our business and has helped us improve our relationship with the local Council by providing a sustainable solution to a difficult waste. We would highly recommend them. I have been using Bio Collectors for my customer now for over 2 years the service has been fantastic...my customers like the fact they can put all sorts of food and coffee into one bin, that makes it very simple to train their staff... 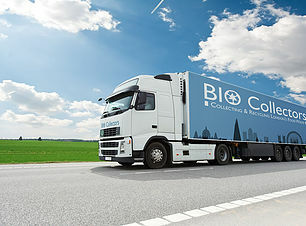 I recommend Bio Collectors to all my customer who have food waste to dispose of. 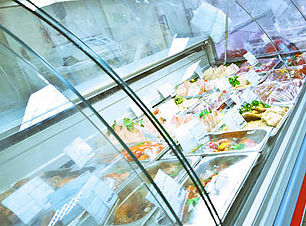 If your business is unlucky enough to suffer a breakdown or power outage in your food storage area, it can result in a large volume of food suddenly needing to be disposed of at short notice. Bio Collectors offer a simple and cost effective, one-off collection service to help ensure you can get your business back up and running with the minimum of disruption.